NEW YORK (AP) — Samsung is trying to move past last year’s disastrous Galaxy Note 7 launch with a successor sporting a dual-lens camera, animated messages, expanded note-taking — and lower battery capacity. The South Korean tech giant is no longer trying to squeeze more battery power into each phone. Last year’s Note 7 had to be recalled after dozens spontaneously caught fire because of defective batteries. Samsung responded by subjecting new phones to multiple inspections and giving the battery more physical protection, taking up room normally available for the charge. Although the success of this past spring’s Galaxy S8 phone suggests that Samsung has recovered from the Note 7 debacle, which included bans on airline flights , any further mistakes could prove fatal. “Here it is from the ashes, literally, a rebirth of this pretty iconic brand,” said Bob O’Donnell, a veteran consumer tech analyst at Technalysis Research. Unveiled Monday, the Galaxy Note 8 will go on sale Sept. 15 in the U.S., about the time Apple is expected to come out with new iPhones. Advance orders for the Note 8 begin Thursday. The phone is among the most expensive, starting at about $930. By contrast, the iPhone 7 starts at about $650 and the S8 at $750. Samsung’s Note phones tend to be niche products aimed at people who use their phones more than the average consumer. But O’Donnell said the Note 8 launch could boost interest in Samsung’s mainstream phones. Jan Dawson, chief analyst at Jackdaw Research, said the phone should be popular among loyal Note users who have had to wait two years since the last model. But Dawson said the price could give consumers pause. 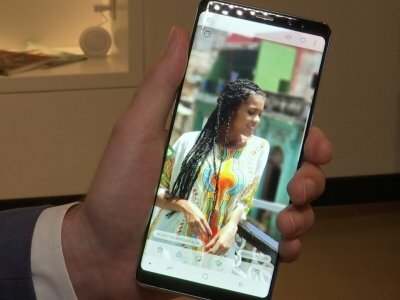 The Note 8 phone offers significant improvements over the last Note model still selling. But the S8 already has one of the Note 8′s signature features, an “infinity display” that maximizes screen size by reducing the frame, or bezel, surrounding the display. The Note 8′s screen will measure 6.3 inches diagonally, up from the Note 7′s 5.7 inches, without feeling much bigger. Unlike the S8, the Note 8 will have two camera lenses on the back — one with twice the magnification — allowing for sharper close-ups. The Note 8 will match Apple’s iPhone 7 Plus in using that second lens for software tricks that blur out the background in portrait shots. Samsung offers more tweaking capabilities after the shot, though Apple may be adding improvements as well in the upcoming iPhones. Samsung’s Note line is notable for its stylus, and the new pen restores some of the hardware improvements introduced — then taken away — with the Note 7. A popular feature has been the ability to write notes on the phone’s lock screen, much like a chalkboard. Samsung is expanding how much people can write — up to 100 screens full of notes, rather than just one. Also coming is the ability to handwrite text messages, rather than just typing them. They are sent as animated GIF files, so friends without Note 8 phones can read them, too. With Apple’s Messages app, recipients must have iPhones or iPads with a recent software update for animation to work. The pen will also enable full-sentence translations for travelers, with automatic conversions of currencies and units such as feet and meters. Samsung is taking a conservative approach to its battery, as it did with the S8 . Capacity is reduced by 6 percent, as thicker walls and other safety measures take away room once devoted to the charge. Still, Samsung says the capacity is enough for all-day use, thanks to efficiencies from better software. To boost confidence, Samsung is also seeking certification from an outside safety lab, UL. But it comes as Apple is expected to release its own super-premium phone for the iPhone’s 10th anniversary. Apple hasn’t said anything about it, though it’s likely to make an announcement in the coming weeks. Carolina Milanesi, a mobile tech analyst with Creative Strategies, said high-end users tend to stick with the system they already have, whether that’s iPhones or Android.